Although Chuck Connors is gone, he still lives on as Lucas McCain — The Rifleman. True, his size — 6' 5", a taut, trim 200 pounds would command attention in any man's league. But the world is well stocked with big men. Chuck chose Seton Hall College in South Orange, N. J., whose basketball team had a reputation for furnishing players to the professional ranks. He played baseball as well, and it was also at Seton Hall that the first wholly unrecognized inkling of his ultimate future flickered momentarily. Chuck won elocution contest reciting Vachel Lindsay's "The Congo". After the war and now with the Brooklyn Dodgers, Chuck, tired of playing in the minors, asked to be sold to the Chicago Cubs—where he played three months before he was shipped off to still another minor league club, the Los Angeles Angels of the Pacific Coast League. This proved, however, to be the luckiest move Connors made since he took up poetic elocution at Seton Hall. 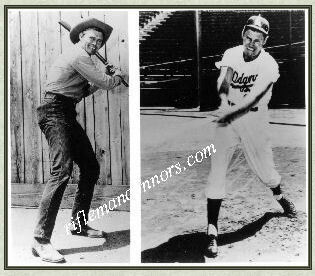 Los Angeles was the home of Hollywood; many Hollywood celebrities made a practice of coming out to the ball games, and Connors was that baseball rarity — a man who could play the clown and still hit .321 and 23 home runs in only half a season. 1. Who was the first NBA player to break a backboard while dunking? 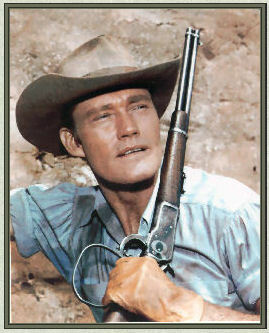 Chuck Connors, aka, TV's The Rifleman. 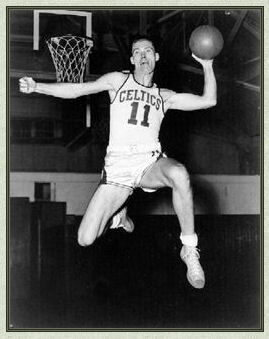 Boston's first home game -- on Nov. 5, 1946 at Boston Arena -- Chuck Connors of the Boston Celtics shattered the first backboard in NBA history during the warm-up before a Celtics game. Connors went on to shatter desperadoes in the television show The Rifleman.